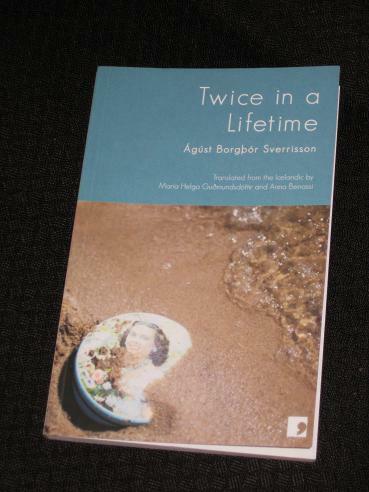 Twice in a Lifetime is a collection of short stories by Icelandic writer Ágúst Borgþór Sverrisson, one I noticed on the website of Comma Press and requested a review copy of. It’s a slender volume, comprising ten stories running to just over 120 pages, set in Iceland over the past few decades, and it’s a book you could run through very quickly indeed. It’s probably best though to space the stories out, and that is how I approached the book. These two stories reminded me a little of some in Clemens Meyer’s collection, All the Lights, and while Meyer’s characters are, on the whole, a little more working class and down on their luck than Sverrisson’s, there is a strong resemblance in the ground the two writers tread. The stories deal with real life, nothing too exotic or flamboyant; in fact, were it not for the occasional reference to geothermal energy and Kronur, you could have trouble placing the stories geographically. One element which ties the stories together is a sense of retrospection, many of them being specifically dated. Quite apart from Lunch Break, 1976 (the shortest of the stories, one in which a stressed-out office worker comes home and has a rant about a sheep’s head left in a saucepan…), several of the stories have the year clearly stated, as if the writer wants to impress the importance of the time from the start of the very first page. While there is no explicit sense of nostalgia, the reader gets the sense that we are meant to be looking for something in the past, something which has perhaps been lost. On top of this preoccupation with the past, several of the stories focus on problematic relationships, marriages that have run their course. In addition to the stories mentioned above, After the Summer House, the longest of the stories in the collection, focuses squarely on a marriage in crisis. It takes place over a few years in which a couple visit their friends in the country during the summer holidays. On the first visit, their friends’ marriage seems to be strained; on the second, they have built their dream summer house and appear to be much happier. But is everything really OK? And how does this reflect on the protagonist’s own relationship? The Penguin Sagas of the Icelanders is wonderful! Can I also recommend Gyrdir Eliason's 'Stone Tree' – also published by Comma Press? I think he's a fabulous writer – very disconcerting and dream-like. One of the best collections of short stories I've read in years. He's also just won this year's Nordic Prize for Literature for his new collection which – I think – is called 'A Walk In The Woods', but not yet translated into English. Eva – Yes, I remember you gushing over that one 😉 I'm sure that I'll be trying that before too long if my Icelandic phase keeps up. Tony – In addition to In the Mouth of the Whale, I read two other Icelandic novels last year, both of which I liked very much: Jon Kalman Stefansson's Heaven and Hell and Audur Ava Olafsdottir's Rosa Candida (that's the French title; it has subsequently come out in an English translation under the title The Greenhouse). Both were terrific. I was especially fond of the last one, but liked both even more than the Sjon book, though I suspect that's largely a matter of taste. I'll also echo Eva's recommendation of the Penguin Sagas of the Icelanders, a vast book I doubt I'll ever finish, but which is riveting every time I turn to it. Good… I think he's a tremendously distinctive writer, one whose skill I can only marvel at. been considering more Icelandic fiction myself & this seems like a good place to start. Gary – It's well worth a try, but very different to Sjón's work, much more of a realistic collection of stories. Two in my Icelandic literature section so far Tony (http://pechorinsjournal.wordpress.com/category/icelandic-literature/) – of them I think The Pets would be right up your street if you've not already read it. Blackly funny. On sagas the two I love are The Saga of Burnt Njal, and Egil's Saga. The latter is more fantastic than the other, both are worth reading. Have you read 101 Reyjkavik? I haven't yet but own it. This reminds me slightly of that, though this sounds less cosy. Do you know why there are three translators? Max – Of the three books mentioned here, 'The Pets' definitely appeals most (I'm not really into crime, and '101 Reykjavik' also sounds a bit out of my comfort zone). Max – Re: the translators, it's a collaborative effort between the first two, but one story had already been translated by someone else, so the publisher stuck with that version rather than having it retranslated.